Pets have never had it better. A decade ago, pet owners in tony apartment buildings in the United States made do with cramped basement “spas” and cleanup rooms equipped with garden hoses, slop buckets and open drains. But these days, the Fidos and Fifis lucky enough to live in luxury developments are frolicking in their own swimming pools, getting high-end haircuts, blowouts and pawdicures on-site, and enjoying prearranged vet visits, play dates and “yappy hours” with their best friends in the building. 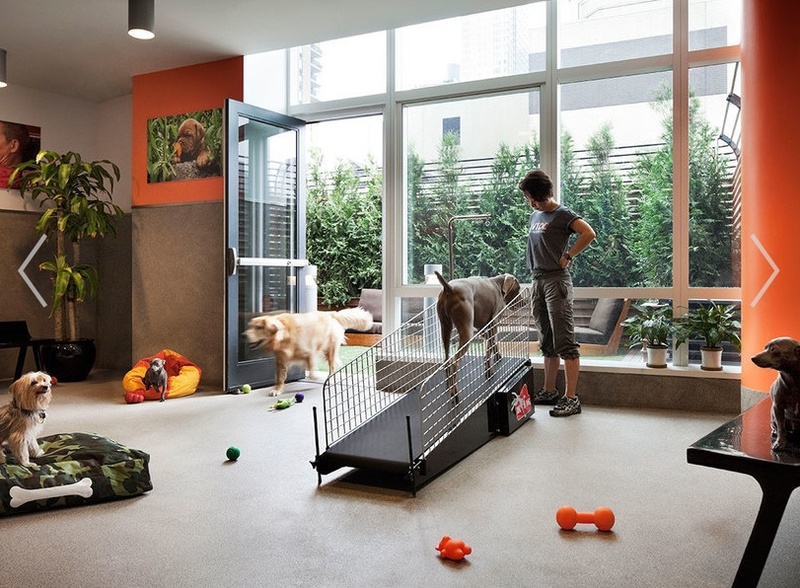 To lure and keep pet-obsessed tenants and buyers, luxury developers in New York, Chicago, Boston, Miami and Atlanta increasingly are offering top-notch pet services along with the expected fitness centers, entertainment lounges, children’s playrooms and rooftop lap pools. After all, “I have long observed that dogs are the children of condo and apartment owners,” said Scott Leventhal, the CEO of the Trillist Companies, a developer in Atlanta, South Florida and South America. At its new YOO on the Park rental complex in Atlanta, Trillist has created a 700-square-foot Pet Respite with two bathing and grooming facilities as well as “doggie treats and supplies and a mural we’re doing for owners of their four-legged friends,” Mr. Leventhal said. Related Companies, a developer with offices and major buildings in in San Francisco, Las Vegas, Chicago, London, Shanghai, Abu Dhabi and Sao Paulo, has created its very own on-site pet-services amenity called Dog City for some of its luxury buildings. These include Manhattan’s MiMA, which has a bone-shaped pool for dogs on its outdoor terrace, as well as Manhattan’s Abington House, The Caledonia and 70 Vestry, and 500 Lake Shore Drive in Chicago. Dog City handlers receive ongoing training on all aspects of dog care, including CPR, first aid, safety and health, and even understanding how dogs are feeling or connecting nonverbally. Dog City also hosts quarterly “yappy hours” with drinks and treats for pets and their owners, and the Lake Shore Drive building has an annual Dog Swim in October, just before closing the pool for the season. “We feel that it’s just extending our concierge service to our four-legged friends,” Mr. Joseph said. And to live in the building, it’s well-behaved dogs only, please. “We interview all of the dogs before they’re accepted,” he said. The pups must pass a temperament test, be spayed or neutered (if they’re over a year old) and have current vaccinations. Other developers and leasing agents are teaming up with existing pet-service companies to help design and staff the pet amenities in their new buildings. The goal is to keep everything on-site and super-convenient for the pet owners. In Chicago, for example, Baroo services nearly 10,000 multi-family homes across 25 properties, offering a variety of dog walk or run programs, on-site playdates, in-home pet sitting, grooming, feeding, vet visits, and training and pet therapy with animal behaviorists. For cats, they provide nail clipping, feedings and playtime as well as daily litter box scoops and weekly litter box change-outs. “All of our employees are individually trained and arrive on site in a uniform,” Ms. Hyde said. Liz Verhyden, who lives in an Equity building in Washington, D.C., with her fiancée and an energetic 18-month-old German shepherd named Ranger, loves that individual attention her pet gets on his walks with Baroo handlers. That includes daily photos and detailed texts. “Did he pee? Did he poop? Did they refresh his water? Then I know what to expect when I get home,” Ms. Verhyden said. Anastasia Kaup, who lives in the luxury Marquee at Block 37 in Chicago with a 9-pound miniature dachshund named Charlotte, is also a big fan of the Baroo services. “As a neurotic dog owner, I want to know that Charlotte seems to be in a contemplative mood today and she’s had half a bowl of water so far,” said Kaup, who also appreciates her building’s fifth-floor covered dog run where dogs can do their business without going down to the street. In winter, Baroo dog walkers look for warm walking areas, and the dogs get booties for snow and ice and full paw and body wipe-downs before they are returned to their apartments. At OneEleven in Chicago, Baroo has a light and bright Pampered Pet Retreat with four pet rooms, including a recreational Puppy Play Space and a Run & Relief Room, which is designed with natural elements like AstroTurf and a fire hydrant. Meanwhile, at its new Grove at Grand Bay in Miami’s Coconut Grove neighborhood, developer Terra is partnering with a local company called Dogtown to provide walks, day care, feeding and vet outreach. Terra also built a swank new 1,500-square-foot spa with multiple bays, lockers and tons of toys and treats. In Los Angeles, which has plenty of parks, beaches and other dog-friendly open spaces—and not very many high-rise apartment buildings—pet amenities are a new thing, said David Solomon, a luxury real estate agent at The Agency in L.A.
“It’s like the nicest bathroom I’ve ever seen, with very expensive tile and state-of-the-art grooming equipment,” is how he described it. High-end agent David Kramer, who focuses on Beverly Hills and Bel Air, agrees with Mr. Solomon’s assessment of the L.A. pet scene. “I’ve also seen houses where people have turned bedrooms into dog play areas,” Mr. Kramer said. Back in New York, the pet spa at 50 West, a 64-story luxury condominium tower rising in Manhattan’s Financial District, will have three stations for grooming, including a ramped shower and dog-washing station. Time Equities, the developer of 50 West, is looking to partner with a veterinarian concierge that would make house calls for sick pups and kitties who live in the building, said Seth Coston, director of condo operations at Time Equities. And they are now vetting grooming services that would provide the dogs at 50 West with VIP treatments, such as show cuts and makeovers with organic shampoos and other products. When it comes to deluxe pet amenity services, Adam Light and Mike Lavora are seasoned pros, having launched their Throw Me a Bone company in New York in 2008. They now have 30 employees who provide on-site pet services such as grooming, walking, training seminars and overnight care for such top-shelf buildings as 15 Central Park West and Gotham West as well as hotels like the Plaza, Pierre and St. Regis.